In a large frying pan, cook bacon until crispy. Add broccoli, onion, peppers, and spinach. Cook until vegetables are soft, and just starting to brown a little. Add butter. Whisk eggs. 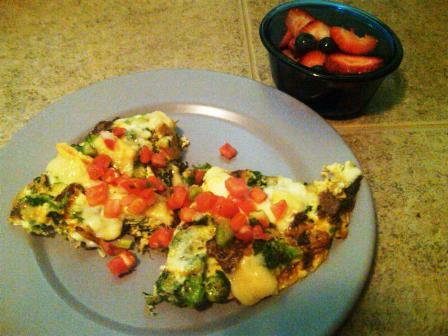 Pour eggs over vegetables. Do not stir. Add salt and pepper. As eggs cook carefully lift the edges and swirl the eggs so the uncooked part runs to the edge of the pan. Repeat until the middle is almost set. Turn off heat. Place cheese slices over the top of the eggs. 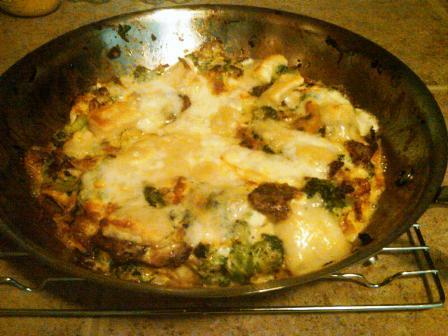 Place pan in oven under broiler for 3 – 4 minutes until center of eggs is set and the cheese is melted and bubbly.